Mark Leidich sent this classic photo. I was sorting through some old photos and found a bunch that I had taken while at the World Championship Prelims at McGill University in Montreal back in 1982 ... heck ... 25 years back. I particularly remember "those days" when prelims at the major regional events was general admission seating. I remember how all of us die-hard fans would get to the gates hours before they would open and then make a mad dash to get those perfect seats to enjoy more than 20 of the top corps that day. If I recall correctly, the "run" for those seats at McGill was a long one from the gate/tunnel and we had driven up there straight through the night before from the Reading, Pa. area. But once in those seats, the venue was great. 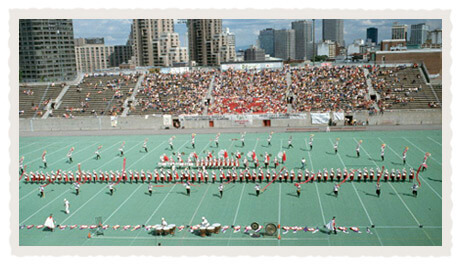 The view of the city from the home stands made for a memorable setting.